There are no additional fees for samples sent from outside Wisconsin. 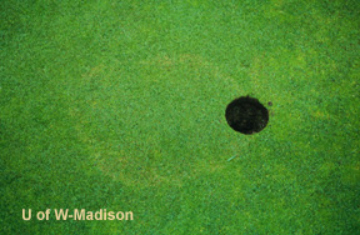 The TDL does not conduct nematode analysis. Please contact the lab for recommendations of where to send samples for nematode analysis. Step 1: You Prepare Samples for Submission. Collect and submit samples early in the week, especially if sending by mail. Send an adequate representation of the problem. 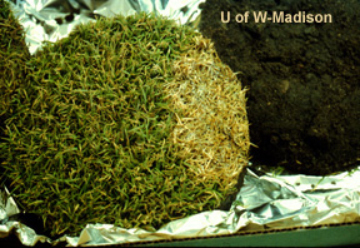 Select samples from the transition zone between healthy and affected turf. Sample when symptoms are evident. A 6″ plug is a good size to submit. Include the roots. Plugs taken with a cup cutter are ideal. 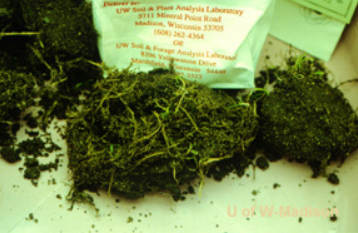 Samples collected with a soil probe are too small. Submit fresh samples. Package and mail immediately. If a sample must wait, put it in a cooler or refrigerator. 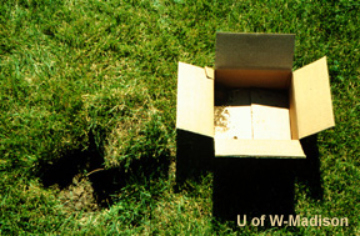 DO NOT SEND DEAD GRASS! Package plugs with different problems separately. Step 2: You Download and Print the Submission Form. You can also fill out the submission form online. Step 3: You Mail Your Sample(s) to Us. Step 4: We Process Your Sample. Step 5: We Invoice You. Step 6: You Submit Payment to Us. Since additional diagnostic tests may be necessary in processing your sample(s), please do not submit payment until you receive our invoice. Click here to pay online with a credit card at our secure web page. Type in the given invoice number in the ‘Invoice’ box and the amount owed in the ‘Amount” box. Please do not pay online in advance of receiving the invoice. Up to three invoices can be paid at once. We accept VISA, Mastercard, Discover, American Express, and Diners Club. 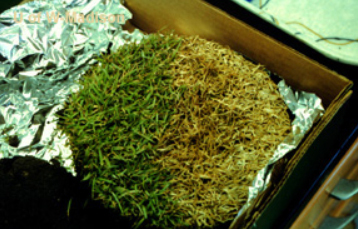 Check – write a check payable to the Turfgrass Diagnostic Lab for the proper amount ($20 per sample for homeowners or $100 sample for commercial managers) and include with sample submission or an invoice will be mailed to your address following the diagnosis. Set up an Account With Us – see our contract information page. Please contact us (see bottom of page) if you need more information on how to collect or package samples. If three or more days have passed since you mailed your sample(s) and we haven’t contacted you, please call us to confirm we received your sample(s).